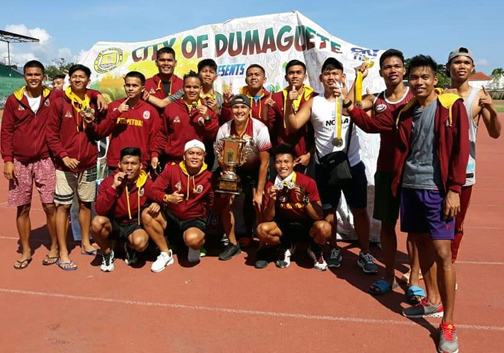 Dumaguete City—Fourteen members of Perpetual Altas track and field team collected 10 golds, 6 silvers and three bronze medals to rule the 23rd Philippine University Games 2018 here recently. Head coach Trece Academia, assistant coach Larick Panes and Philip Silloco were impressed by the showing of the team and its determination to win in preparation for the coming National Collegiate Athletic Association Season 94 Track and Field Championship in March 2019. Bryan Niño Dumaguit won golds in the 110m hurdles and 4x100 relay; Jansen Jim Montecina captured a gold in the triple jump; while Edwin Bajo clinched golds in the 800m and 4x400 relay and a silver in the 400m and classic relay. Jerick ‘Toto’ Arzaga bagged golds in the 4x100 relay and 4x400 relay, a silver in the classic relay and a bronze in the 400m, while Sherwin Barsalote picked up a silver in javelin. Michael Batuto collected a gold in the 4x400 relay and silvers in the 1500m, 3000m; Prince John de los Santos had a bronze in the long jump, while John Michael Urgel secured a bronze in the 5000m. Thrower Ian Ofalia won a gold in javelin throw; Jerwin Calupit got a bronze in the discus throw; Alfredo Dadivas clinched golds in the 400m hurdle, 4x100 relay and 4x400 relay and silvers in 100m and relay; while Warren Villarosa tallied golds in the 100m, 200m, long jump and 4x100 relay and a silver in the classical relay.